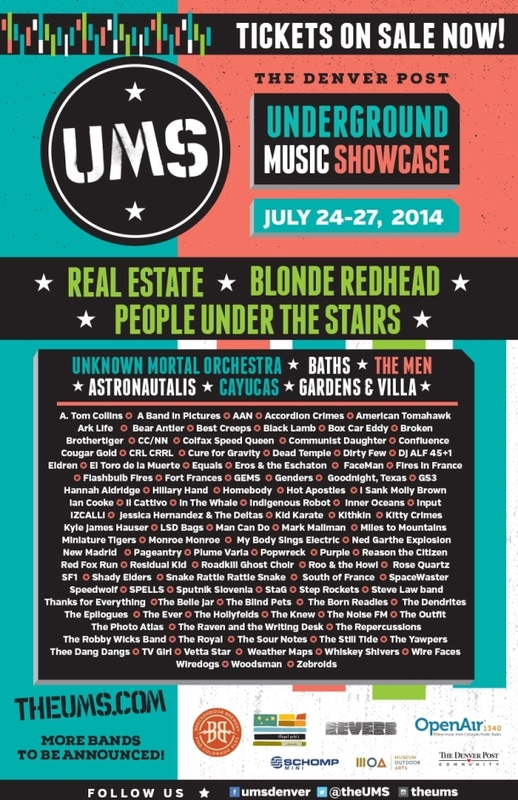 The 14th Annual Underground Music Showcase Has Arrived! Denver’s premier indie music festival, The Underground Music Showcase, is setting the stage for its 14th year. On July 24th through July 27th The Denver Post produces a showcase featuring more than 400 local & national bands performing at over 20 venues along Broadway boulevard in Denver’s historic Baker neighborhood. With sublime venues like Moe’s BBQ, Illegal Pete’s and the Hi-Dive hosting acts like Real Estate, Blonde Readhead, and People Under the Stairs, it’s sure to be an exceptional experience! Now equipped with a full lineup and schedule, concert-goers can choose to purchase a $50 4 day pass in advance, or a single day pass for only $35 at the door. Click HERE to purchase a pass & head on down to South Broadway for a weekend full of awesome music!